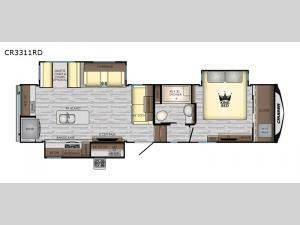 Step inside this CrossRoads CR3311RD fifth wheel and experience a camping trip like none other! It features a front private bedroom with a spacious closet which is prepped for a washer and dryer, a comfortable king bed, a dresser, and even a bench for sitting. Meal prep will be a breeze with the kitchen island giving you extra counter and storage space. If you're feeling adventurous and want to experience the outdoors to its fullest then you can grill up your best burger at the outdoor kitchen. When you're ready to wind down the night, head into the living area with your favorite beverage of choice where you will find an entertainment center and watch a movie on the 40" LED TV with a fire below warming you up. 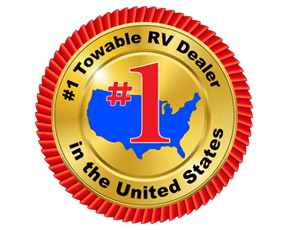 In any Cruiser fifth wheel you will enjoy residential features and lightweight towing. These fifth wheels are all half-ton towable and designed to bring comfort and convenience to all of your adventures. A variety of floorplans make it easy to select the one that best meets the needs of your family, whether you desire more space for sleeping, more space to move about, or more space for the things you wish to take along. The kitchen is filled with stainless steel Furrion "Chef Collection" appliances, hardwood Maple cabinet doors, and 70 lb. full extension steel ball bearing drawer guides. On the outside, enjoy the painted front cap with Clear Shield for protection, a one piece seamless Super Flex roof with a 12-year warranty, plus exterior grade speakers, and an outside shower, plus so much more. The power awning with LED lights will also be a valued feature for those who love to spend as much time outside when camping. Come make your selection today!